Welcome once more, good readers, to a special edition of At the Scene of the Crime! In this ongoing series of crossovers, I have managed to convince my fellow mystery bloggers, somehow or another, to join me in discussing a book/author/etc. Today’s victim is Steve, better known as The Puzzle Doctor. This rogue mathematician blogs at In Search of the Classic Mystery Novel, and has appeared on this blog before, in a crossover review of Paul Doherty’s An Ancient Evil that celebrated my reaching 100 posts. So when we decided to team up again for another review, the first question to pop up was: what should we review? An initial suggestion was The Poison Maiden by Paul Doherty, seeing that our reaction to The Cup of Ghosts was so different. But this idea was scrapped due to the book’s length and my having midterm exams at around this time of year. 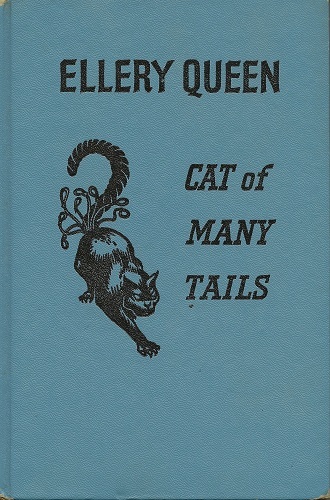 But suddenly, an idea galloped onto the scene, when I recalled that Steve here had a very—unorthodox, shall we say?— reaction to Ellery Queen’s Cat of Many Tails. It’s a book that I consider a personal favourite, and which many believe is the finest work penned by the EQ writing team. 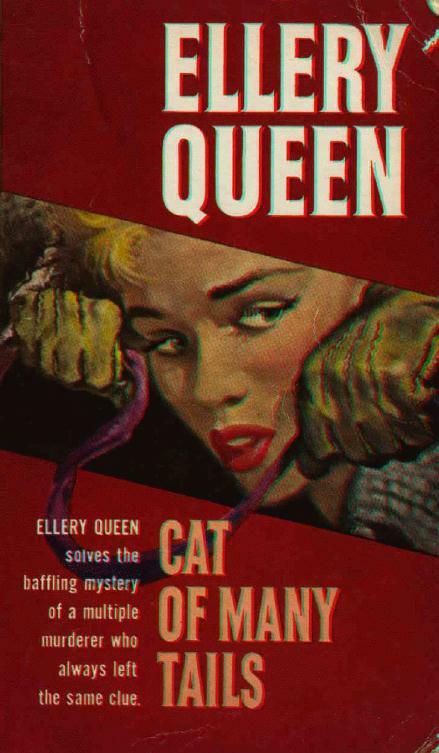 And wouldn’t you know it—one of Steve’s on-going projects is to read all of Ellery Queen’s output and review it! So the elements were set in place for a potentially controversial review. 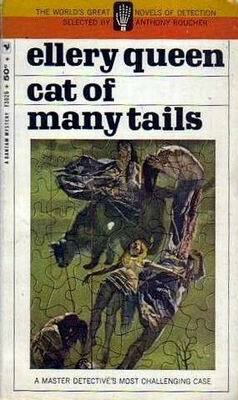 Would I enjoy Cat of Many Tails upon a re-read? Just as (and arguably more) important, would the Doc’s opinion stay the same? There were at least three ways to find out, but the most feasible one was to simply read the book. So here we are today! Steve, thanks so much for joining me today! Hi there, Patrick, and readers everywhere. I think before we go on, I'll explain my background with Ellery Queen. After reading the majority of Agatha Christie's work as a teenager, I was unable to find a replacement and drifted away from mystery fiction - the internet wasn't around then, so it wasn't as if I could easily find a replacement. The obvious author available at the time was Ngaio Marsh, but her work, both then and since, has never leapt out at me. Anyway, about ten years ago, I found a John Dickson Carr book - Panic in Box C - in a charity shop and my obsession kicked in again with a vengeance. After getting through all the Fell and Merrivale books, the obvious next candidate was Queen. I think I was lucky here - almost all of the Queen books that I found - and I haven't read them all yet - were from the The Something Something Mystery era, which, with one notable exception, The American Gun Mystery, are excellent puzzles. The writing style oscillated wildly from book to book, but the puzzle was always great. 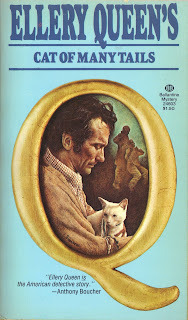 Cat of Many Tails is a very different sort of book, for reasons that I'm sure that we'll go into later, and certainly I found it a bit of a shock to the system. Now I'm more versed in some of the later Queen efforts, in particular a run of three reasonably-to-rather-iffy entries into the canon, am I going to reconsider my previously rather scathing opinion of the Cat? 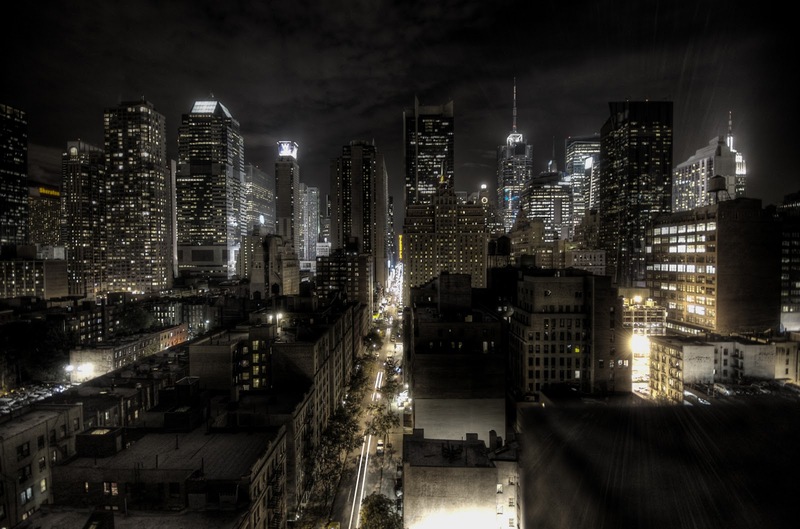 Cat of Many Tails is set in 1940s New York, where a serial killer is running loose. Victims are apparently chosen at random, strangled to death and found with a piece of coloured cord around their necks, either pink or blue. And as the Cat continues its vicious killing spree, New York becomes more and more panicked. There can only be one man for the job: Ellery Queen! First off, let me say that I consider this one of the finest mysteries ever written. I love the plot idea of the serial killer story, where everything is explained through fair clueing. It isn’t often that we see it done this way—especially nowadays, authors tend to explore the killer’s psychology instead of making it into a traditional mystery. But when we see it done well, it’s one of the finest plot threads the genre has to offer. Agatha Christie’s The ABC Murders is the gold standard here, and in fact, very few authors have been able to come up with a better explanation than Christie’s for this puzzle. OK, we are going to disagree on this one. I agree that this is a well-written first rate thriller. 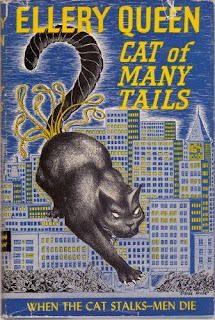 As you say, the character of New York resonates throughout the story - the first half at least - as the tension ratchets up a notch again and again with seemingly no sense whatsoever to the Cat's actions. The supporting characters are good - even the traditional instant romance element works well in this case. I did find that the atmosphere of New York pales once Ellery makes the critical deduction... we'll come to that in a moment... as with a name to focus on, the story becomes more and more about that individual. But a fairly played mystery? We have to disagree on that one. Yes, you might spot the pattern that Ellery spots and there are certain clever deductions to be made, such as the reason for a couple of the patterns, but they are only makeable in hindsight. Even Ellery stumbles upon the crucial clue and then instantly leaps to the conclusion - you have about a paragraph to put two and two together, and even then, it's pretty obvious as the clue involves the apparent name of the Cat. And then the mystery completely falls apart for meta-reasons. This is an Ellery Queen book, and if the murderer is named and explained with eighty-odd pages to go... well, that wouldn't be an Ellery Queen book. Unfortunately, while the whole truth makes narrative sense and lends the thriller element some real emotional weight, as a mystery, it's obvious in the extreme. There are other directions that the plot could have gone here, but the writers, it seems, were less inclined at this stage of their writing career, with the tricksy plots of the earlier books. Compare it to the bluff, double-bluff and triple-bluff of The Siamese Twin Mystery, and this just looks like the plotter wasn't trying. You mentioned the gold standard - The ABC Murders. Now that is a proper mystery. Even if you don't fall for the obvious candidate, the actual killer is well-hidden but very fairly clued. I honestly don't believe that this is the case here. I have to disagree with you when it comes to the fair-play aspect (it’s such a difficult one to define, isn’t it?). I think the book plays perfectly fair, and while it’s a mistake on the killer’s part that leads everyone to the Cat’s name, the explanations for the other details, especially the pattern that links the victims, are just sublime. (It’s so unfortunate that one of the clues might fly over modern readers’ heads because it is somewhat dated.) Finding a pattern is truly maddening (though I remember tumbling to the bit about age when I first read the book) — almost every victim is single, for instance, and yet that can’t be the pattern because one of the victims is married. But I'd say that it isn't fair-play because while the pattern makes sense after it is revealed, I don't think there is enough information there to actually deduce the killer. Similarly, Ellery only gets the actual truth after effectively playing Twenty Questions with a person who is only guessing at the facts as well. To be honest, given what he finds that makes him realise that something is wrong, he's an absolute chump not to piece it together there and then. I think it's crucial that this was your first Ellery Queen novel - it was at least my tenth or later and pretty much every one that I'd already read was a puzzle first. The writing style fluctuated wildly from book to book, but at the core, there was always the puzzle with the clues hidden in plain sight. This one simply doesn't do that, which is why it disappointed me at the time. Now, I appreciate it as a pretty decent thriller in its own right and an interesting experiment in a series that was perhaps becoming bogged down in a standard pattern. But it's not what I look for in an Ellery Queen novel. So the controversy remains! 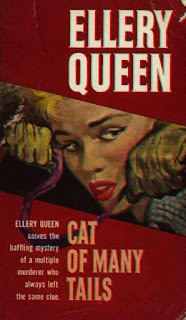 My impression has always been that it was a perfectly guessable pattern, but of course, since it was the first Ellery Queen novel I ever read, I wasn’t expecting a tricky puzzle in the vein of the brilliant The Greek Coffin Mystery or the slightly-less-brilliant The Siamese Twin Mystery. But what of the novel’s other, non-puzzle-related aspects? I found it extremely well-written, with one minor qualification being the rioting, which I thought was one step a bit too far (something I’d expect to see more in a movie like The Dark Knight than in a detective novel from the 1940s). Yet it all manages to remain within the realm of plausibility. The killer and the motive were very interesting, I thought, and it is good to see a twist different from Agatha Christie’s. As good as the Dame’s solution is, it does become tiresome after derivative copy after copy is written. And the motive, as well as the general situation of a serial killer on the loose, would make this an appealing book for modern audiences. It may not be dark and gritty, but it is far more engaging than anything that comes from Dan Brown’s pen. 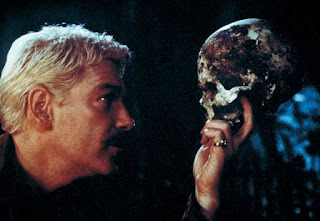 If you can't you tell how tortued this monologue is, the skull should help. Personally, I dislike reading that kind of stuff that perhaps that’s another reason I enjoy escaping to the Golden Age of Detective Fiction. The writing may have been subpar at times (I don’t think anyone could mistake Freeman Willis Crofts for Edgar Allan Poe) but rarely was writing as pretentious as it can be nowadays. Oh, the voice of the killer is one of my many bugbears of mystery fiction. It either gives the reader "bonus clues" or makes the fact that the killer has been hiding in plain sight when in fact he's a drooling psychopath seem nonsensical. Very occasionally a writer does something clever with it. 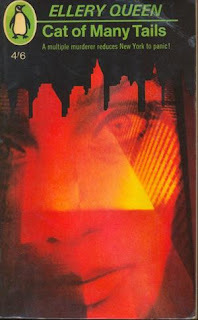 Nev Fountain has a refreshing twist in Cursed Among Sequels and Jeffrey Deaver plays a clever trick with it in The Coffin Dancer, but more often than not, it doesn't add much to the book - there are some others where is adds a bit of atmosphere, I suppose. You're dead right about the thriller-ness of the story. The atmosphere is outstanding and from a writing point of view, this is probably one of the best-written Queen novels. I tried to do a bit of research to see if the riots were based on a real occurrence, but couldn't find anything - they stood out to me to as one step too far, but maybe one of our more knowledgeable readers can fill in a gap there. I thought the atmosphere tailed off a bit when Ellery thinks he has the solution - as if New York suddenly knows that the Cat is about to be caught - but as the focus at that point is catching the Cat in the act, the switch in focus is understandable. It certainly stands up with any modern day thriller - above many, in fact, due to the restrained nature of the writing. 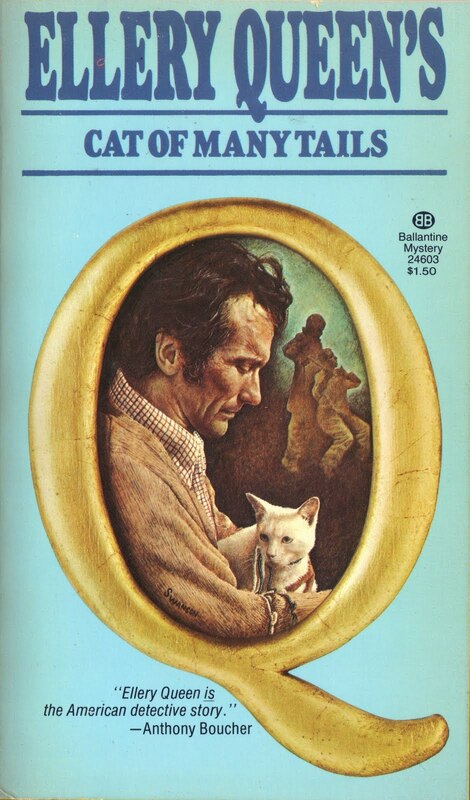 The twist - by which I presume you mean the real nature of the Cat - has been copied as much as The ABC Murders though. In fact the recently reviewed The Square Root of Murder by Ada Madison uses a variant of it. I think there are very few ways to effectively hide a serial killer in a proper mystery and this and The ABC Murders are the two easiest ways. Actually, this one is probably easier to do convincingly but once the first reveal happens, the fact that the second one is coming is hard to hide. Shall I sum up my opinions then? Should I leave that last bit unanswered and tease at a future sequel? Oh, well, I’ll quickly defend my position: I say it is better is because the solution to Siamese Twin relies entirely on a somewhat-dubious piece of evidence that I was unconvinced of. It took an experiment to lend the solution an element of plausibility, but the possibility is treated as a certainty and that’s where I have problems. Overall, out of four stars, I’d give this book 3.5. The writing is excellent, though the rioting is a bit of a stretch. The mystery seemed to me perfectly fair, but even I have to admit that one of the clues is somewhat dated— it’s almost unheard of nowadays to live without something that was not altogether commonplace in the 1940s (how’s that for manoeuvring around Spoiler Rapids?). Ellery Queen (Oh, I’ll just refer to the writing team in the singular “he”) is not as interested in flummoxing the reader as he is with giving the story some real emotional weight. The thriller qualities of this book are absolutely outstanding, although if you’re familiar with Ellery Queen, you will probably anticipate some of the twists. But if you’re looking for a solid, well-written and entertaining book, you can’t really go wrong with the Cat of Many Tails. Steve, once again, thanks so much for joining me today! Oh, a score. Right, I'll give it a seven out of nine tails of the cat. Great thriller, not so great mystery. Thanks for having me, Patrick, and congratulations on your first anniversary. PS Twin beats Coffin because of the overall cleverness of the plot - the thing that someone accidentally does to overly complicate matters is one of my favourite bits of misdirection in any mystery. Gents, I cannot recommend strongly enough to you both: "Blood Relations: The Selected Letters of Ellery Queen 1947-1950." You will find many of the letters deal with "Cat" - and the two cousins (who fight over just about everything) really go to town on many of the points you both raise in your critiques. Dannay was responsible for the puzzle, Lee for the writing, and each jealously guarded his own turf from the other. It's fascinating stuff, and particularly powerful if you've read "Cat" and the two other novels discussed and debated here - "Ten Days Wonder" and "The Origin of Evil." Thanks for the tip, Les. I think The Passing Tramp looked at these recently, but I'm saving this until after I've re-read Ten Days Wonder and The Origin of Evil, both of which I have very fuzzy memories of - basically, loss of memory for the first and dead dog for the second - looking forward to the insight though. I think you know what I'd say about this one (get ready for the broken record!) Again, the question is being asked as if it "is" or it "isn't"...the question of whether "Cat" is fairly clued has the same as answer as whether Agatha Christie was sufficiently tall. Personally, I found "Cat" an extremely satisfying book, and the sense of "the solution was there before my eyes the entire time" was stronger for me than it was in all of the period I Ellery Queen novels (with perhaps the exception of "The Spanish Cape Mystery," in which the retrospective obviousness of the solution wasn't balanced with any satisfying surprise). All I can say is that the book wasa reprinted by IPL about 20 years ago on my recommendation as an untouchable classic. Ooh. I finally got round to reading this one the other day. I chronicled my attempts to solve it on my shiny new blog. Unfortunately I came up with a solution that was much more in keeping with the other EQs I'd read! So I came up with something goofy when it's actually very sensible. I'm afraid I agree with Steve, though. Although it's a very good solution, it just isn't very fairly clued. You can't work out the connection until you have the same piece of information Ellery gets, by which point it's OVER-clued. Sure you could GUESS it. But then you could make that same guess about any group of victims. It's easily fixed. I don't see why they had to be coy about the first suspect's original profession... or they could have given us some relevant dates and we could have been ahead of Ellery... or they could have told us the content of a conversation that was strangely left out... I don't think any of those would have given too much away, unless you were very astute (and isn't that the point?). And is it really "unpretentious"? That bit about the talking statue of Prometheus might beg to differ! Also they use Weltanschauung and Gemutlichkeit unironically! Unless they were having a German noun bet I'd say at least one of the cousins has pretensions towards 'literature'. Still, it's much more restrained than the other ones I've read. I really enjoyed it. I thought Greek Coffin was terrible, and had sworn off EQ for good, but this has brought me back on side! @monescu I'd be interested to know what you meant... Are you suggesting that it's impossible for a book to be unfairly clued? Or that it's fruitless to discuss it because a book is what it is? I'm afraid I haven't seen any of your other comments on the subject. Great debate guys - I love this book and bought the IPL reprint when it came out (thanks for doing that for us Doug by the way!) and it completely blew my mind. The almost apocalyptic atmosphere, the sense of mounting hysteria and the grandness of its conception, and of course the real possibility that Ellery might genuinely fail, all helped to make this an absolute classic. I'm very pleased to see all the responses! Thank you to you all for taking the time to comment! Oh yes, of course-- I do know about this edition (which didn't seem too great from what I could tell) but I was thinking about Hollywood as in a big-screen, big budget production. After all, serial killers are a big thing in movies of late, what with THE RAVEN or SE7EN. @Patrick I think you'd have to do some major revisions to make this into a film. You'd certainly have to change the ending. It would be tough to pitch a film with a climax where the main character and the culprit don't even meet! But the solution would probably work much better. With a film I think people would be more ready to believe that the plot has shifted focus from an investigation to a manhunt and isn't going back. I hadn't heard of The Raven before today. Wowsers. I was also upset to realise that Se7en was released almost 20 years ago! Fairly clued or not, it's a landmark. Way ahead of its time. Paved the way for all serial killer novels and the psychological profiling that goes hand-in-hand with that genre. It's brilliant in that regard. Much better handled than Charles Dutton who did it 20 years earlier in his three serial killer books, but never got noticed by anyone for his ingenuity. If I were a list maker I would put CAT OF MANY TAILS in my top ten of all time. And Sergio is right - the TV movie version is horrid. Don't bother hunting for it. 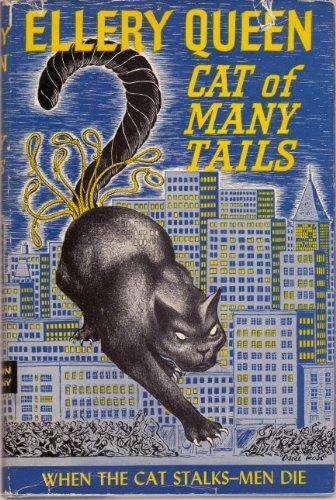 They changed the "cat of many tails" metaphor into a mythological reference to the many headed beast called the Hydra. Only one of the many things in the script that was poorly thought out in the "hip 70s" update.